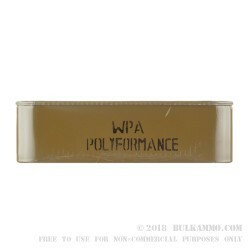 These 800 9mm cartridges from WOLF Performance Ammunition’s Military Classic line of ammunition are made in Russia and come sealed in a durable spam can complete with an authentic Cyrillic “Д” marked on the side. 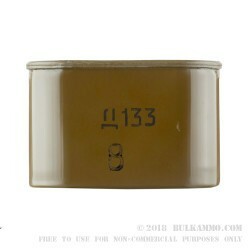 True to their Russian origin, these rounds feature Berdan primed steel casings. For that reason they’re not reloadable, but steel’s lower price than brass is well reflected in these cartridges’ appealing price tag. 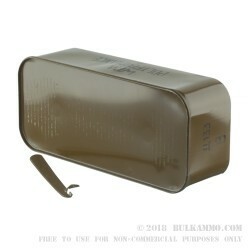 As all Military Classic casings are, these are polymer coated to improve their resistance to corrosion and help them feed reliably in semi-automatic weapons. This round sports a 115 grain projectile, which is a fairly standard weight for its caliber. The bullet’s full metal jacket makes it perfect for extended target practice, as they will spare your bore from rapid lead fouling that causes drops in accuracy without fairly frequent cleaning. That jacket will also cause this round to penetrate more substantial targets with ease, something to take into consideration if you would ever fire them in self-defense.